It goes without saying that us Jeep owners are a pretty easy target when it comes to burglars. In the winter, most of us run a fabric top that can easily be cut, and in the summer with tops and doors removed, we make it even easier. I have had my eye on Bestop’s Underseat Storage box for quite some time, but was confused as some retailers said it would fit in my 2013 Unlimited, and others said it would not work with fold and tumble. So today I purchased one and installed it. 1. Set out all parts and ensure they are there. Mine came out of the box a little dirty, but that’s no big deal. 2. 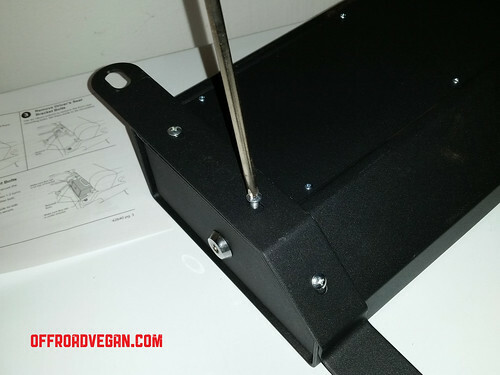 Install the brackets to the box using a phillips head screwdriver. 3. 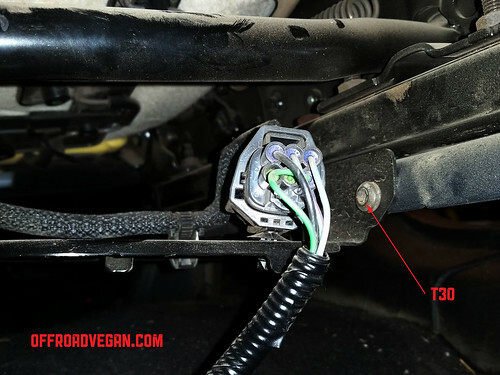 This is the “optional” step for us 2011+ JK owners. 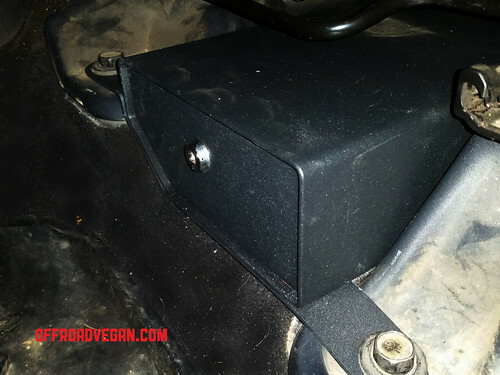 Remove the steel plate under the seat with a T30 Torx. Cut the wiring harness from the plastic clips. The torx was a little hard to maneuver in there, but it worked. 4. Discard the plate and the screws. Use the included zip ties, running one through the torx hole. I only used one zip tie. I zipped it loosely and adjusted the seat to make sure it wouldn’t bind up. Then I tightened it down. 5. Using an 18mm socket, remove both forward seat bolts. I had to consult a breaker bar for a little extra love to break them free. 6. Slide the locker into place under the seat. 7. Line up the original seat bolts and reinstall through the brackets using the 18mm socket. Tighten them down good and snug. 8. 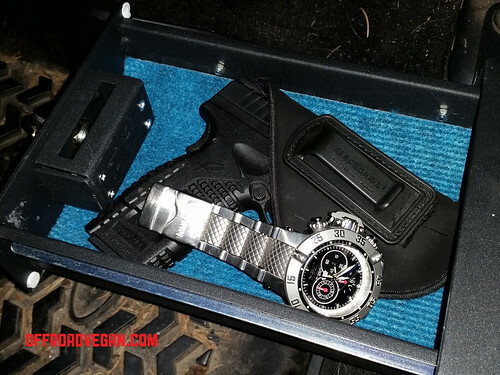 I tested the fit for my concealed carry, the Springfield Armory XDs in .45. I am combining this simple install with an immediate review. Overall, I am very happy to finally have some secure storage in the Jeep. The product comes with two solid keys, and a nice blue mat that lines the steel box. I plan on making an elastic wristband with one of the keys for those days at the swimming hole (so I can lock the electronic key in the box). Do not plan on quick access into this box, either. Especially while driving. Those relying on this locker for their concealed carry need to consider this. I did add the key to a quick release key chain so I can remove it without taking the keys out of the ignition. 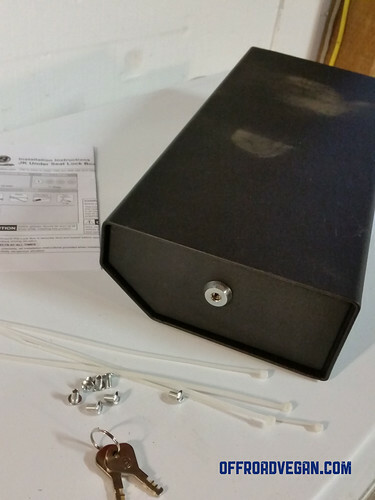 But the location of the box, and the way the lock and key are designed, prevent quick access. My only gripe is that this locker is not attached in the rear of the box, only the front. Even with the forward bolts attached tight, the rear of the box still lifts up easily. Also, while highly unlikely, a smart thief, knowing all they need is an 18mm wrench and about 5 minutes, could still get this out pretty fast and easy. Overall, however I am happy and look forward to a summer of secure, door less jeeping! Remember to use coupon code OFFROADVEGAN when buying this from Northridge 4×4! **FULL DISCLOSURE: I purchased this product from 4 Wheel Parts at full retail price. 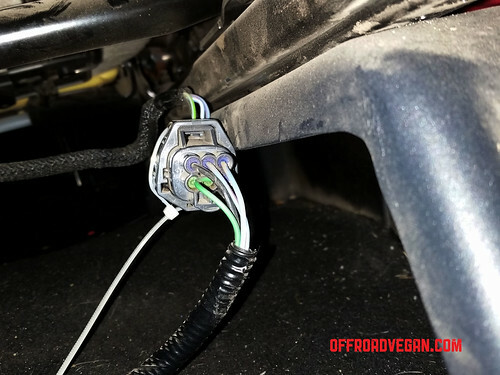 Previous PostProduct Review: Gardein Fishless FiletsNext PostWhat is the Best Phone for Off-roading?